Drop arm awnings are an deal solution for shading over windows at any level as the arms of the awning can be fitted in any position to allow for the desirable level of shade to be achieved. Suitable for hospitals, shops, offices, schools, care homes, community centres and other workplaces, drop arm awnings are a highly durable, cost-effective sun shading solution. Most drop arm awnings have gas and spring assisted arms to the sides and are manually or electrically operated – this is to allow for efficient operation to suit your needs. These awnings act as a perfect alternative to the traditional dutch canopy awning. Drop arm awnings have an adjustable angle which can be adapted to offer exactly the right level of shade and protection every time it is used. Excellent technology and highly durable materials transform what should be a standard awning into a home improvement fashion accessory. They can be manufactured to fit any window meaning each window on a building can have one. This is ideal for office blocks who suffer from the heat and blinding light of an early morning or late evening sun. As the operation is mainly carried out by the side arms, the square or round fully cassetted housings are very small and discreet and they are ideal for multi window installations or where headroom is tight – such as above many shop fronts. Office and workplace windows do not lose their outside view but are still shaded from the intense sunlight during the early morning and late afternoon. This still allows for a natural source of light which creates a positive atmosphere. Drop arm awnings are also ideal for shop fronts due to the fact they cater for buildings with small levels of headroom. As with any awning, the drop arm awning offers high level of sun shade protection which allows the cool temperature to become prominent and creates an airy atmosphere. The gas struts hold the awning material taut and provides shade a for very low sun. 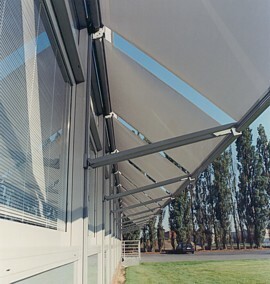 This awning is available in a wide range of Markilux covers and materials. 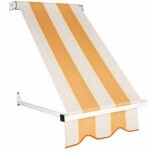 This can include classic acrylic fabrics or sunsilk snc fabrics. 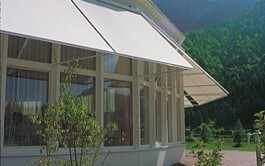 All drop arm awning fabrics can be viewed here.